$65.99 Advance Tabco EG-1472 Green Epoxy Coated Wire Shelf 14" x 72"
$29.34 Winco VC-1472 Chrome Plated Wire Shelf 14" x 72"
$56.65 Winco VEX-1472 Epoxy Coated Wire Shelf 14" x 72"
Provide additional space for your kitchen supplies with the Thunder Group CMSV1472 Chrome Wire Shelving 14" x 72". Perfect for restaurants, hotels and food service facilities, this piece includes plastic clips to allow for easy setup wherever storage space is required. 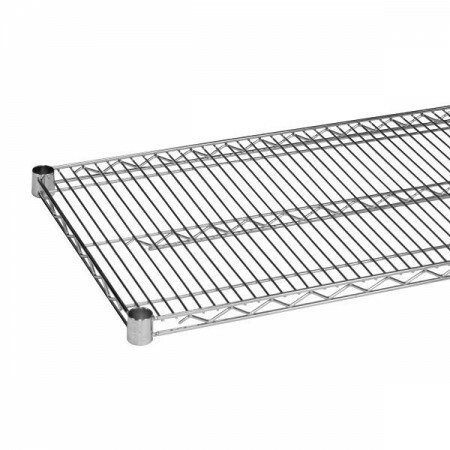 Featuring a chrome-plated metal construction, this NSF certified, rust resistant wire shelf is beautiful to look at and will withstand the heavy demands of high volume commercial use.